Some places here in Moscow are just easier to reach on foot. For today we dispensed with the bus and set off, our first stop the Kremlin. As it was a Saturday, the streets were crowded, even more so once we reached a long park-like area in front of the Kremlin. Somewhere a loudspeaker shouted in Russian, so Anna explained that it was a children’s Christmas party, where the parents dropped off their children and the youngsters were treated to films, and other entertainments and at the end given a gift to take home with them. The party began outside the walls and ended inside. There was a long line to get into the Kremlin, and as we stood there in meek, properly polite American style, many of the Russians clearly felt that lines were just like other rules, to be ignored. One of the things we had noticed during our travels was this utter indifference to rules, whether it be parking, going though security scanners (the only exception being boarding the train in St. Petersburg, and even then we did not have to remove watches or belts) or lines. Not, mind you, that it mattered, since we were all getting in at some point, right? All the same, though, it was annoying. The security at the Kremlin, manned by young and very stern-faced officers, required us to set our handbags in a tray whilst passing through the scanner. Anna warned us not to make fun or joke on our way through. Somehow I ended up being the first of us to reach the security checkpoint, and, very intimidated, pointed to my watch in a mute request to ask if I needed to take it off. The officer flung out a hand as I began to remove my handbag to put it on the tray and snapped, “Go! Go!” I went. I’m not certain if the interior of the Kremlin is, at first glance, disconcerting because of the years of stories we heard about it or if it’s because there is an aura of secrets kept and held throughout long centuries and to the present day; this place is still the Russian seat of power; even after Peter the Great moved the capital to St. Petersburg the tsars were all crowned in Moscow. It was not until 1955 that the public was allowed in to visit the museums and cathedrals. Our group was subdued as we walked across a wide snow-covered expanse of brick roadway to look across the river. Even Anna’s voice, on the headset, was softer. Our first stop was in a square with a number of Orthodox cathedrals. Between the Revolution and the Soviet era these were turned into museums. Although most are still museums, one or two have resumed their original function. The Assumption Cathedral, its foundations laid in 1326, is one of those in which services are now held; the men were required to remove their hats and it was suggested that the women cover their heads (most of us had scarves anyhow, so it was easy to comply). The next cathedral, the Archangel’s Cathedral dates its foundations to 1333, although the present-day building was not constructed until 1505 and 1508. Our final cathedral was the Annunciation Cathedral, once reserved for the Tsars, and a bridge spanned the distance between the Kremlin and cathedral. It no longer exists. In the square was the most enormous Christmas tree I had ever seen, and Anna told us that once the children had finished with their party, they walked around and around the tree until a parent or guardian collected them; she said that in over 40 years of this they had never lost a child. Our tour was a little complicated by the need to see things and also dodge the huge crowds. We passed through a guarded gate and into a sort of plaza, on the other side of which is the Kremlin Military School. Nonchalantly swinging long white batons, uniformed officers patrolled that plaza, blowing warning blasts on whistles if anyone dared step off the pathway. We saw the world’s largest cannon (the Tsar Cannon), which had been created in 1568, only fired once and then never used, since it was too heavy to use in actual battle. On the way down to The Armoury, we passed the world’s largest bell (the Tsar Bell), which had never been used because when it was cast in 1735 it remained in the moulding pit and in 1737 a fire broke out in the pit. In an attempt to put out the fire, cold water fell on the bell, causing it not only to crack but an 11.5 ton piece fell off (the bell itself weighs 202 tons). Saving the best for last, we joined the line for the Armoury Chamber. Here, once again, we encountered the Russian disregard for lines; as we reached the door a young man inserted himself into our group, a real problem because our entry tickets were for a specific time and a specific number of entrants. At the door, one of the attendants counted us, but I suppose it could be considered obnoxious when she started to count the young man and I said he wasn’t a part of our group. Unleashing a torrent of Russian, she pushed him back through the doorway and gestured the rest of us inside. And interestingly enough, he just stood outside with a big grin on his face. It was weird. The Armoury Chamber is an astonishing treasure house containing such items as the diplomatic gifts from visiting dignitaries over the centuries, ancient state regalia (they even have a pair of Peter the Great’s jackboots, which he himself made — and they are enormous. I’d estimate they are as tall as I), including coronation clothing. There is one vast room devoted to horse-drawn carriages and sledges, preceded by ceremonial horse harness modeled by actual taxidermy-preserved horses. Even hurrying, this entire process took almost four hours, and we were ready for lunch. Red Square had been turned into one giant street fair for the holidays, with booths and music and throngs of excited people; it was with difficulty (and due to the vigilance of Anne and McKenna!) that we managed to emerge with our group intact in front of the Goudenov Restaurant. This was another traditional Russian meal in a domed room, served quickly and efficiently by a staff garbed in traditional costumes; there was very little time between courses. 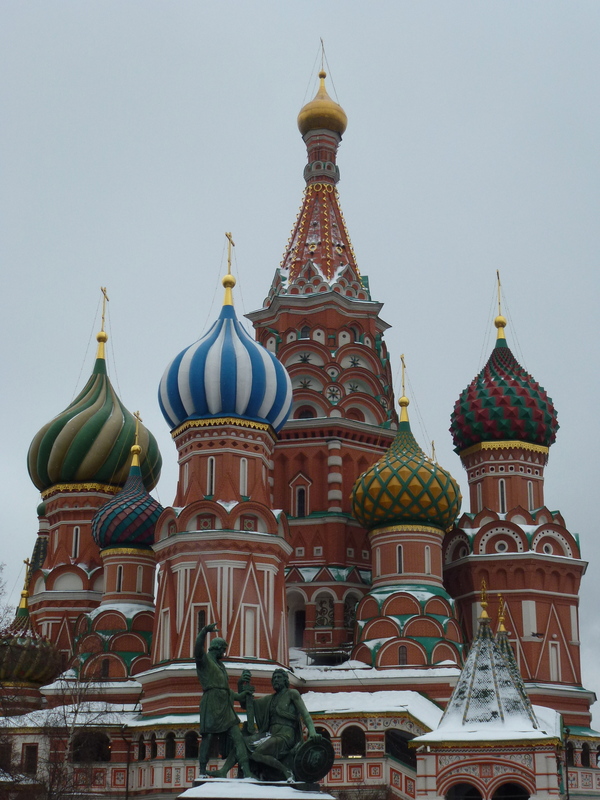 After lunch came the visit to St. Basil’s Cathedral. Some of us preferred not to take the shortcut through the state historical department store but instead enjoyed the chilly air to meet the others in front of the cathedral. Snow fell lightly, even as it had done since we embarked on our journey, punctuated by the sounds and music from the carnival. This cathedral actually consists of 10 chapels and was originally commissioned by Ivan the Terrible (we were told that the Russian word is actually closer to “fearsome”) to mark the capture of Kazan from the Mongol hordes in 1552. Completed in 1560, it is now a museum, although a yearly service is held on the Day of Intercession in October. During restoration work in the 1970s a wooden staircase was discovered in the walls and it’s now used to gain access to the very center of the cathedral. The spiraling stairs are not for the faint of heart, being at least a foot or more in height, with no railing, but it’s worth the climb. At the top, we were met by a group of four men who performed a rich and resoundingly beautiful a capella piece that amply demonstrated the excellent acoustics (yes, they were selling their CDs and yes, I bought them). With time running out, we gathered on one of the porches and decided to go ahead and take the subway tour of the Soviet-era train stations. Begun in the 1930s, this was the USSR’s largest civilian construction project, with a mind-bending blend of Baroque, Classicism, and Soviet Realism, among others. The hallway between each train platform is elaborate, with mosaics, stained glass, marble, bas-reliefs, bronze statues and each station is different. Talk about extraordinary! It was very much a fabulous ending to a day filled with marvels. Sounds like I should add Moscow to my agenda. Thanks so much for the time I know you are investing in recounting your travels. The extravagant descriptions and great visual/aural details are wonderful. Sounds like the Goudenov restaurant was a self-fulfilling prophecy… not up to the excellence of some of your Russian meals. Keep ’em coming!